Edith Head design for Grace Kelly in the 1954 film Rear Window. My favorite era in Hollywood costume design was the 1930s with Dietrich and Lombard and their glamour. But the films of the 1950s came about as close to that kind of glamour as Hollywood will ever see again. The films of the decade did not have the look of the 1930s, where everybody was rich and totally unrealistic, but they offered an opportunity to show different levels of society as well as different values. – Edith Head (1897-1981), Hollywood film costume designer. And the Winner is … Jacqueline West? Jacqueline West is the only American nominated this year and was at one time a resident of the Bay Area, designing her own line and running her own boutique in Berkeley, California. She has strutted down the Academy Awards red carpet before having been nominated for Quills (2000) and The Curious Case of Benjamin Button (2008). 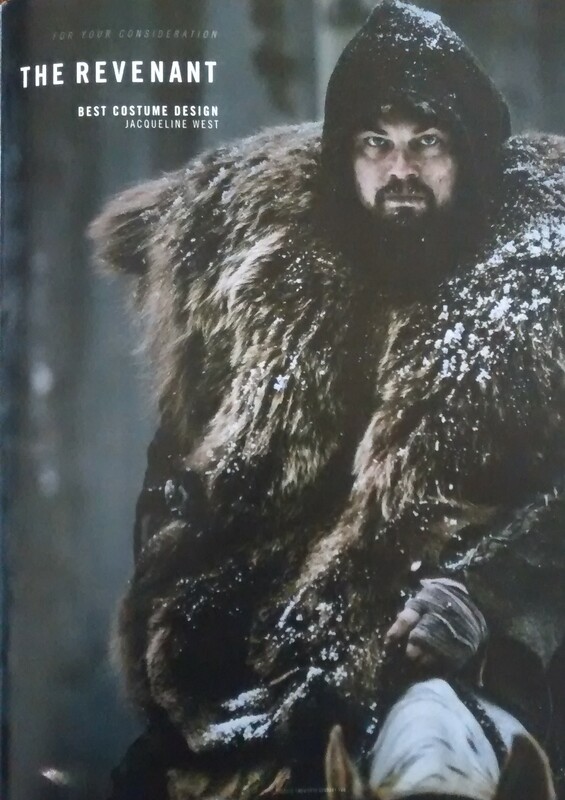 The Revenant staring Leonardo DiCaprio, is the true story of American fur trapper Hugh Glass, who, on an expedition in 1823, is attacked by a bear and left for dead by his team. But he doesn’t die and that’s the movie. Ms. West told The Film Experience blog that she was familiar with this story and started her research reading Glass’ journals: In this one journal it said that when the trappers arrived off the boats after two years out trapping you couldn’t tell what the fabric was of their clothing, it was so covered in grease. I took that as a mantra! The costumes for this film are unlike the other nominees this year in that they had to be well worn and heavy for the cold rugged outdoors and there’s not much variation. Lots of fur was used, of course, most of it from Canada. It’s not a showy film for costumes but there was still a lot of creativity and crafting involved. Costumers are nominated for an Oscar by other costumers who are members of the Academy, just as directors nominate other directors and so on. Winners are chosen by ballot – each member of the Academy casts a vote for each category. There are currently around 6300 Academy members. Having not seen all the films nominated, I can’t say who I think will or should win. I know what appeals to me based on my research and that would be The Danish Girl but that’s purely what I like and what I think was well done for the period. Sometimes what is outstanding on a technical level, is not visually exciting or attractive. As we know costumes in films and plays are not fashion, they are one part of telling a story. Best of luck to Jacqueline West and congratulations to all the nominees. And the Winner is … Paco Delgado? This is Paco Delgado’s second Oscar nomination, having also been nominated in 2013 for Les Miserables. This time around he’s up for The Danish Girl. Mr. Delgado is from the Canary Islands and now lives in Madrid. He studied set and costume design but he initially worked mostly on sets, not intending to become a costume designer. However, small playhouses with tight budgets often needed his help and he’d put the costumes together as well. He enjoyed the challenge and people liked his work so he stuck with it. The Danish Girl tells the true story of Einar/Lili (Eddie Redmayne), who is known as the first transgender woman. The year is 1926 and the place is Copenhagen and Paris. Einar and his wife Gerda were both artists, and so Mr. Delgado started his research by looking at the couple’s work and photographs of the pair. He also studied the popular fashion designers of the era, such as Chanel and Poiret. Very much aware of the subtleties of costuming a transgender person, Mr. Delgado said in an interview with Harper’s Bazaar: Our point of departure was always to think that Lili was trapped in a body that didn’t belong to her. Therefore we had to create almost a prison-like idea, where she was in prison in the masculine body and that’s the reason we created this sort of very restricted [costume] in the beginning of the movie. Since it was difficult to find actual 1920s clothing that wasn’t too delicate and/or too small for the actors, Mr. Delgado used material from antique dresses and built new ones to fit. A job well done, I’d say. Good luck to Paco Delgado. Come back tomorrow for some reading on Jenny Beavan, costume designer for Mad Max: Fury Road. And the Winner is … Sandy Powell? British costume designer Sandy Powell has been nominated twice this year for Cinderella and Carol, both starring Cate Blanchett. Studying at Central Saint Martin’s College of Art and Design, Ms. Powell quickly became in such demand for her stage costumes she left before completing her degree. Soon she was working in film and became a repeat visitor to the Academy Awards. Nominated 12 times she has won for Shakespeare in Love (1998), The Aviator (2004), and The Young Victoria (2009). For Cinderella, Ms. Powell says she worked closely with Ms. Blanchett who plays the wicked stepmother. The two collaborated and traded images, both women inspired by the glamour of the 1940s. Ms. Blanchett’s character, Carol, is a wealthy woman who enjoys fashion so luxuries abound in fur coats, leather gloves, and pearls. Interesting choices were made, such as putting Carol in “sack” dresses a less girly alternative to Dior’s New Look, and the use of rich muted colors. It so happened that this vintage, heavy 40s beaver coat was originally mine, one of my earliest vintage buys that hung in my closet for decades. It was so heavy and took up so much room I brought it to work. We actually took a photo of Sandy trying it on and exclaiming this was exactly what she had in mind and exactly the style and shoulders and size and color she envisioned for her actress and it made her day! So it went from my closet to Sarah Paulson’ s shoulders! 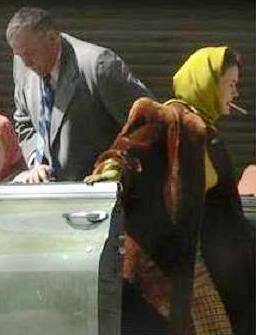 You can catch Helen’s vintage fur coat in the car scene when Sarah Paulson (Carol’s friend Abby) in a NYC car scene. Great story Helen, thank you! Congratulations to Sandy Powell for her double nomination. Check back tomorrow and read about Paco Delgado costumer designer for The Danish Girl. A young Edith Head before she developed her iconic look. This was probably a photo taken by Paramount Pictures for whom she worked from 1924 to 1967. Just after Dior brought out the New Look, every film I had done in the past few months looked like something from the bread lines … I vowed I would never get caught by a fashion trend again … When skirts became full, I widened mine gradually. If lengths were at the ankle, mine were mid-calf. The result has been that if you look at my films it is very difficult to date them. – Edith Head (1897-1981), legendary film costume designer and eight-time Academy Award winner for Best Costume Design. Her last win was in 1973 for The Sting. In the run-up to the Academy Awards ceremony this Sunday, February 28th OverDressed will have a new post every day this week, giving readers a little tidbit on each nominated costume designer this year. Check back tomorrow and read about Sandy Powell, costume designer for Carol and Cinderella. Hey readers, please make sure to tune in next week for the usual Monday Fashionable Quote of the Week and then starting Tuesday, check back for a special daily installment on the four Oscar nominees for Best Costume: Sandy Powell (Carol & Cinderella), Paco Delgado (The Danish Girl), Jenny Beavan (Mad Max: Fury Road), Jacqueline West (The Revenant). While researching The Great Gatsby, I enjoyed the detective work and the discovery of all kinds of ephemera in archives, catalogs, and magazines … But, I too found my inspiration in the text. What’s particularly interesting about Fitzgerald is that, unlike many authors who never mention clothes, he was obsessed with how clothing tells you who people were. He describes in great detail every outfit Gatsby wears because Gatsby’s creation of himself as a gentleman relied on his ability to gather attention to his social station. – Catherine Martin, costume designer. 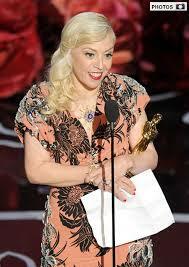 Ms. Martin won her third and fourth Oscars for best costume design and best production design – The Great Gatsby. She also won best costume and production in 2002 for Moulin Rouge.